Our first new season of the year is finally upon us. January feels like the longest month of all time and February the quickest. March brings a new moon and with it a new season and with any luck the better weather! More commonly known as Easter nowadays, Ostara marks the first official day of Spring. The boys have been spotting daffodils, crocuses and snowdrops for weeks now and there are green shoots appearing everywhere. The lighter and longer days are definitely coming and I think once this snow clears Spring preparations will be in full swing! March 20th at 16:15 is the official Vernal Equinox. I explained to the boys that this is when the length of the day and night are equal. A perfect balance. Astronomers use this day to mark the seasons and measure the length of time it takes Earth to orbit the sun. The pagans use this day to celebrate life, specifically rebirth and renewal; hence all the bunnies, eggs and spring cleaning we all get a bit carried away with at this time of year! Thanks to my beautiful Mother’s Day gift I have a lovely new book to stick my nose into and read up on the roots of this particular Pagan Sabbat. Eggs and rabbits symbolise fertility and represent the Goddess, outside all the new life is clear to see with green shoots and flowers everywhere. All the pastel colours – if there was ever justification for me owning a Grimms 12 piece Pastel Rainbow then this frankly is it! Amethysts and rose quartz are cleansing crystals. Embrace the Spring cleaning vibes and make your home clear and bright. It’ll be lamb for dinner so we don’t forget to acknowledge the new life now we’re coming into lambing season! Living where we do lambing is all around us. We did some Egg related crafting this weekend, you can find my earlier blog post here! Today our stunning new Gwawr rainbow arrived from Babipur. It’s name is Welsh for sunrise and it is beautiful. It is also perfect for a celebratory blessing spell to give thanks for the sun rising and bringing the light back from the darkness of Winter. As today is all about balance we did a balancing stack with the new rainbow and set up an altar so we could have fun with a little magic. The boys decorated it with fresh flowers, sheep and rabbits (also managed to eat about half the mini eggs without me noticing!) then we lit a candle and said what we were looking forward to for Spring. At 4:15pm we blew the candle out – well Edward did, so we lit it again and again! The boys are looking forward to longer and lighter days, all the strawberries from the local farms to fill their bellies, getting outside and planting all their seeds and watching them grow. I’m in complete agreement with them! Oren in particular loves gardening and can’t wait to get back to the allotment – neither can I as he is slowly filling my house and window sills with seed trays and a million wee pots! Once they’re out of the way I can then put all the pretty Grimms celebration rings and figures back and reclaim the house with clear windows full of light! Our Spring cleaning is still progressing from our mass cull in February. We’re working on a room at a time now but definitely progressing. By the time we’re finished we’ll be just in time to start over on the first room again! Life is a never ending cycle and we’re just along for the ride here! Next No boys, I’m not dying…I’m on my period! 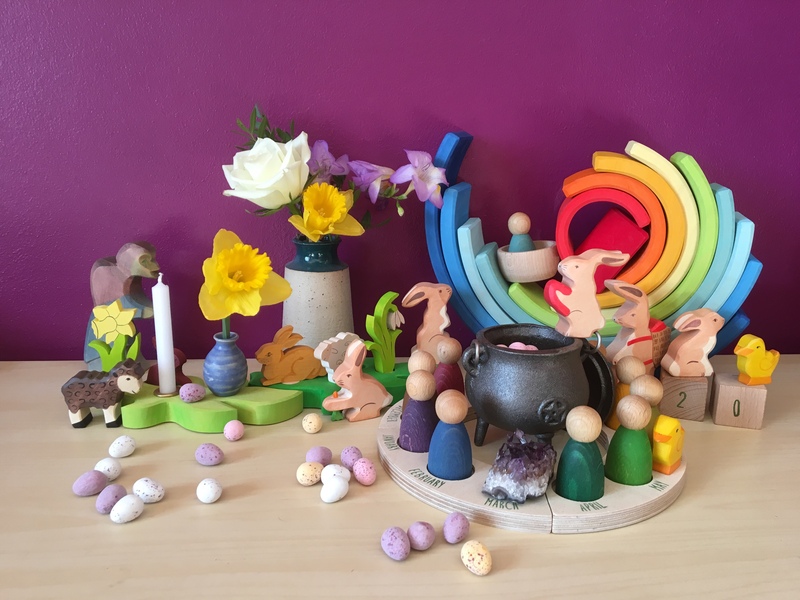 Lovely post and stunning pictures, I love the cauldron full of eggs… yum! I love the Witch she’s just perfectly beautiful! oooh and the painted decorations are gorgeous!